It has been ten years since Aubrey and Ellie died. Ten years. I never thought I’d get through ten minutes without them let alone ten years. For those of you who don’t know my story, my twin daughter died after 7 and 13 days of life in 2008. I was 28 years old with a 2 and a half-year-old son simply trying to grow my family. I wasn’t any different than any other mom I knew and there were no special circumstances to my situation. One day I was pregnant with twins and in a blink, I was in preterm labor for what is still an unexplained reason. My labor was unstoppable and it forced my sweet girls into the world way too soon. They fought as hard as they could but there is a reason babies are supposed to stay in their cozy womb for nine months instead of six and all the advanced medical care in the world isn’t always enough to make up the difference. Ellie died first on day 7 after her intestine ruptured. Then Aubrey died 6 days later. We chose to remove her from life support after a second brain hemorrhage stole her quality of life. I watched the light go out of her after her sister died and when her brain filled with blood for the second time I didn’t see any fight left in her. I did what every mother never wants to have to do – let go. As I write this I still can’t believe that decision was ten years ago because it feels like yesterday. That means ten years of crying, of missing them, of asking really hard questions, and waking up every morning having to make the same decision again and again; to keep going. Ten years means a lot of mistakes, a lot of successes, and a lot of transformation. Ten years has earned me the opportunity to offer some wisdom because I’m still close enough to remember but far enough away to see more clearly than I did when my grief was new and my loss was recent. The bottom line is this; I’ve learned a lot about healing (emphasis on the word healing) in ten years, helpful things that I wish someone would have shared with me. This isn’t a ten-part recounting of my grief. We don’t need any more of that in this community. We all know what grief looks like, we are living it. What is missing from this space are more examples of healing. If healing is possible, we should see it, it should be all around us. And, in case you are wondering if you can trust me, I can only say this; I have not walked a perfect road and I’ll never pretend that I have. I reacted to my grief in some ugly, destructive ways. I also responded to my grief in beautiful and meaningful ways. Under all the pain, anger, and disorientation of grief is a fighter with an inexhaustible love for life. This combination of hope and my refusal to give up is what I credit for the healing I have experienced. That and lots of cups of tea. So, can you trust me? Maybe not with a houseplant (I seem to kill every plant I’ve ever had in my care), but with that tiny spark in you that wants to believe that healing is possible even though grief is crushing every ounce of hope out of you? ABSOLUTELY. You can trust that if I can heal, you can too. So, for the next ten weeks, I’ll post one lesson a week, recounting the epiphanies that impacted my healing most. I hope they have the same impact on your healing. Questions? Please reach out to me in the comments. I’ll do my best to help anyway I can. Thank you for sharing your story. Your beautiful girls will be remembered. I lost my beloved AnaBella on the 19th of May 2018, she caught NEC at 30 weeks gestation. She lived 28 days and fought hard to live. Its only been 4 months for me and Im grieving, my soul calls to her. In ten years what has kept you going? I’m so sorry for your loss. You are grieving of course and you should give yourself lots and lots of grace. 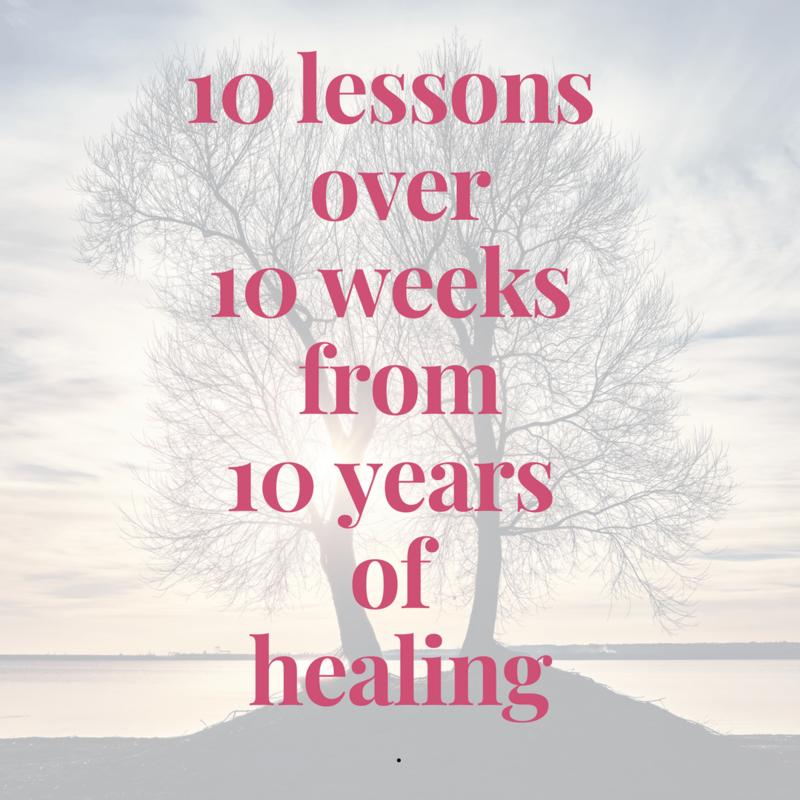 I’m happy to share with you what has helped me heal over the last decade, but while you read this I want you to remember that it is still early for you. Grief demands a season of pure survival. Early grief requires snot, tears, a billion cups of tea, hugs, rest, and asking for a lot of help. Just getting out of bed in the morning is an accomplishment. Breathing. Getting to the grocery store. Taking a shower. All these things are big deals under the weight of such sadness. Don’t expect too much right now. Go one day at a time. Make one small choice that supports your heart and brings you comfort every day. You’ll get stronger, but not overnight. Be kind to yourself. Your sweet girl is worth crying over. A lot of things have kept me going. The biggest one of them was the promise I made to myself to heal. I didn’t want to be sad forever so I was “driven” for lack of a better term to find, use, discover, and create if need be, the things I needed to stoke the dwindling fire in my grieving soul. The first one was tea. I drank cups and cups of warm soothing tea. That is why I create Teamotions (www.teamotionstea.com). Tea was essential. It was like carrying around a security blanket or holding someone’s hand. I needed it. I still drink tea daily to comfort and soothe myself. The third was surrounding myself with loving, supportive, understanding people and setting boundaries with unsupportive, judgy, or clueless people. You need a support system but that support system needs to be rock solid. My support system has changed over the years because my needs have changed. Don’t be afraid to ask for different help or make different choices as your needs evolve. What works for us at one point might not work for us later and that is ok.
Fourth, I protected my sleep and energy output. Hot yoga, chamomile tea, warm baths, not over-committing myself…I simply wasn’t operating on all cylinders and I knew it. I learned to say no to a lot. I went to bed when my toddler did. I underachieved. I knew that striving and pushing were not for this season. When I grew stronger and had more energy I did more, but I didn’t force it. I waited until I was ready. And I didn’t let anyone else put pressure on me. And lastly (not really last but the last thing I’m going to mention because the truth is many many things added up to a decade of healing) I decided to keep going. I just decided. And every day I re-decided. And if I had a give-up or give-in day that was okay too and the next day I just decided once again to keep going. Ten years later I re-decide every single day to heal. It’s a lifestyle, a choice, a constant process not a destination. I can also tell you that for me that first 18 months were the hardest. And after ten years I DO NOT REGRET healing. I don’t regret fighting for my own heart. Remember this, your baby is honored more in your healing than in your hurting.